A few weeks back I was sent a bottle of Akvinta Vodka. I had never tried it before and decided I needed to first taste it straight- as is, from the bottle and not chilled. I was surprised by how savory it was. But I did not take that into consideration when I started mixing cocktails. 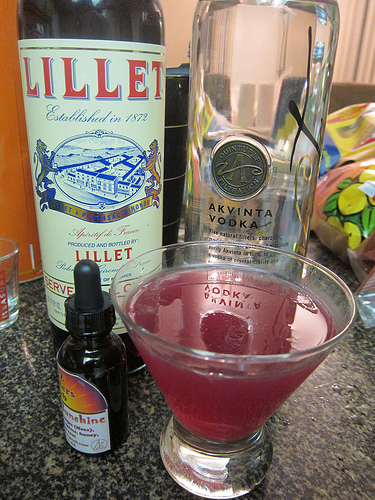 First I mixed the Akvinta with Lillet Rouge and added a few drops Arizona Bitters Lab‘s Orange Sunshine bitters. I decided it wasn’t quite right or sweet enough. Back into the tin it went and it was drinkable. My next few attempts weren’t getting any better. I kept trying to use this vodka thinking the end result would be more of a typical sweet vodka cocktail but really, this vodka would be better suited as chilled shots with Russian food. Or perhaps as a “martini” or a Kangaroo (Akvinta, vermouth, stirred and served up— I’d go for a cocktail onion over a lemon twist). Then I heard Kate Grutman over at Formosa Cafe was doing an infusion with the Akvinta. 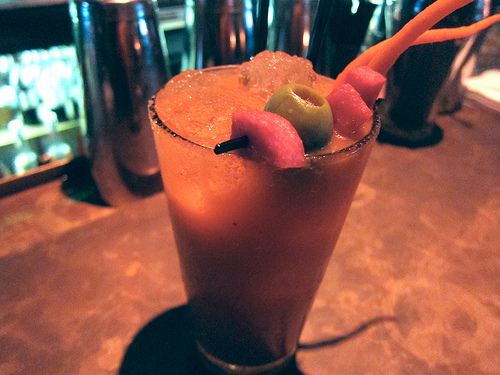 Specifically she came up with a duck confit infusion for Formosa’s fabulous Bloody Mary. Her new drink called Duck Down has the Akvinta washed with duck confit, Vince’s original Bloody Mary mix, lime, Sriracha and garnished with fried spam, gobo root and an olive. It was in a word, delicious. I don’t think I gulped down a Bloody faster. I also really enjoyed the fried spam and pickled gobo root. This was umami city. I think I’ll make a Bloody Mary next with my Akvinta. I have plans for the wonderful heirloom tomatoes now in season. This entry was posted in alcohol education, alcohol tasting, bars, bartenders, cocktails, history, hot bartenders, la, la cocktails, los angeles, spirits, the minty and tagged akvinta vodka, az bitters lab, bloody mary, formosa cafe, kate grutman, lillet rouge, vodka. Bookmark the permalink. ← MCC: Is There a Book Idea On Your Cocktail Menu?